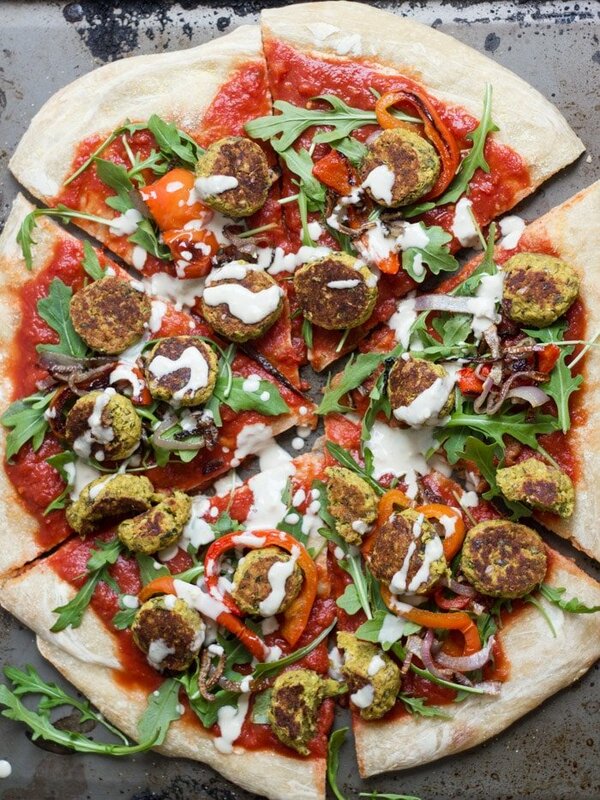 This vegan falafel pizza is made with spicy harissa-spiked tomato sauce, roasty-toasty onions and bell peppers, and creamy tahini sauce. You might need to eat this pizza with a fork. Let’s face it though, the best pizzas are those that require forks, right? In this case it’s so worth it. Every time I make pizza I kick myself for not making pizza more often, and this pizza was no exception. 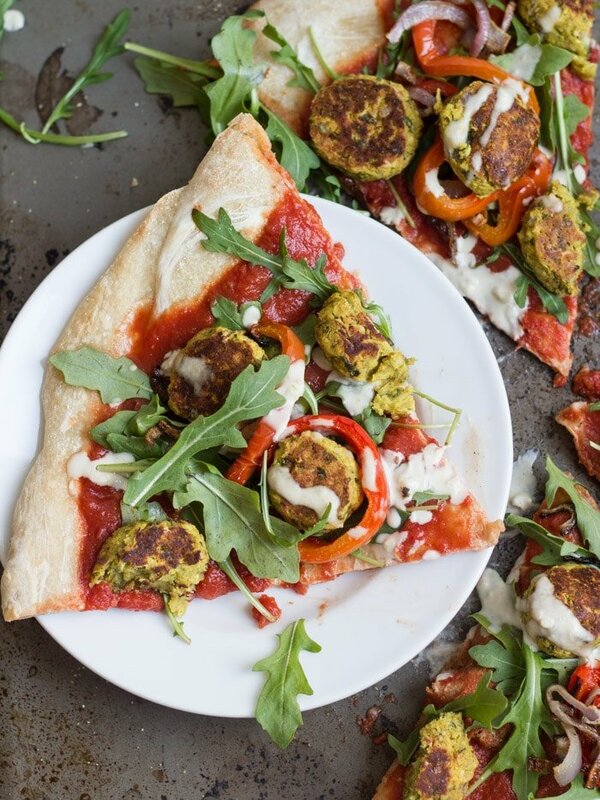 Each slice is kind of like a little falafel sandwich, all bready with tahini sauce, veggies and falafel patties piled on top, but eating it with a fork, all sloppy pizza style, makes it way fun. If you tried and enjoyed these stuffed peppers, then this pizza is probably for you. I realized shortly after I put it together that the flavors and ingredients were pretty similar, with the exception of the crust, which makes the pie form of the meal decidedly more indulgent. I had a jar of harissa on hand that I received from the lovely folks over at Casablanca Foods, so I decided to throw a few spoonfuls into some tomato sauce and see if I could create a super simple spicy pizza sauce. It was awesome and added just the right amount of kick. There’s quite a few steps to this one, so give the recipe a good read before getting started, but it’s really not as complicated as it sounds. You’ll have three things in the oven at once, so plan well as far as space is concerned, but the great part is that if you work efficiently, each time you stick something in the oven you’ll be perfectly timed to get started on the next step, throw that into the oven five minutes later, and so on until, voila, everything comes out at once and you’re all set to assemble the pie. Preheat oven to 400°. Line a baking sheet with parchment and brush lightly with olive oil. Place all falafel ingredients into food processor bowl and pulse until well blended. Roll mixture into 1 inch balls and arrange on baking sheet. The mixture will be soft and delicate, but you should be able to roll it. If it seems too soft, sprinkle in a few panko breadcrumbs. Flatten balls slightly and brush tops with olive oil. Bake 30 minutes, flipping halfway through, until browned on both sides. Toss veggies with olive oil and arrange on baking sheet or in roasting pan. Place in the oven with falafel and bake until browned in spots, flipping once, about 25 minutes. On a lightly floured surface, roll pizza dough into a 14 inch circle and place on baking sheet or pizza stone. Brush the top lightly with olive oil. Place in oven with falafel and veggies. Bake 20 minutes, or until browned and puffy. While everything bakes, place sauce ingredients into a small saucepan and place over medium heat. Bring to a simmer and allow to cook just until the sauce thickens a bit, about 5 minutes. Season with salt and pepper to taste. Stir all ingredients together in a small bowl, thinning with as much water as needed. Season with salt to taste. Spoon tomato harissa sauce over crust. Top with roasted veggies, then greens, then falafel. Drizzle with tahini sauce. Serve. Anything with harissa, or indeed chickpeas, has my heart. This looks so tasty! OMG this sounds absolutely perfect! 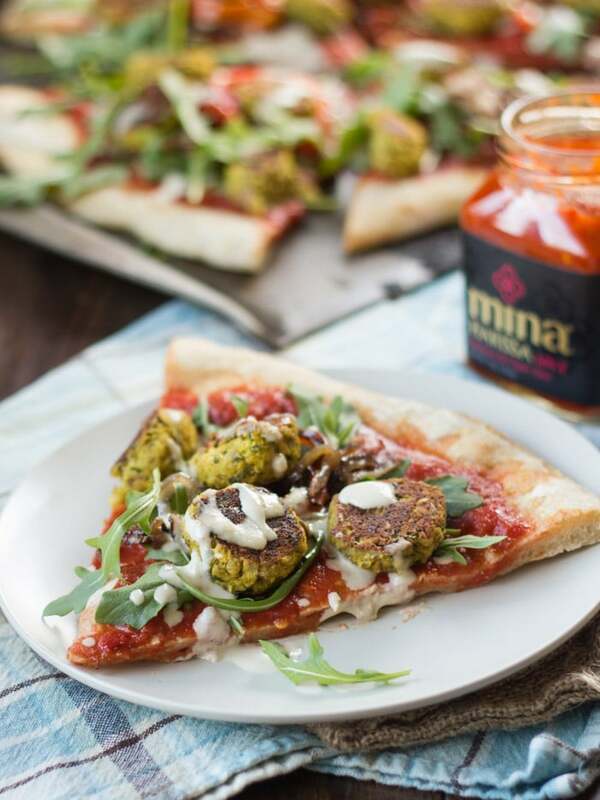 I love harissa, falafel, and pizza…what more could you possibly want in a meal?! This looks delicious, definitely going to have a go at making this.? Thanks Lucy! Hope you enjoy it! Hi! This looks amazing! Just one question! Could I substitute a different flavorful spice for the harissa that is not spicy? I am not huge on spicy foods.